okay entry, go unto your fate. Hslesperance - Hometown - I like the percussion beats, and the various woodwind melodies. The introduction is like a curtain opening to a welcoming village. It reminds me of a village for a grand fantasy game! Danilo Ciaffi - Home - This is a really cool chiptune, it brings out the NES home town feels in a lot of games. I can say that having tried to make 8-Bit takes a lot of learning curve, well for me at least hehe, so good work in producing this one! Basisti94 - Hometown - I like the chord progression and the harp like instrument for the melody, with a soft flute for a nice touch. The part near the middle with the 16th? notes is a unique idea, I think that if you add tremolo picking or 32nd notes it can add to the feels too. Third: Tigerchild - A Town on the Brink of Change - This is a really nice piano piece, and I like the dynamic flow of the melody. It has a relaxing feels and is played really well. It reminds me a little of lost woods from zelda: ocarina of time, but I can also imagine it for a mystical town. Second: Birdnet - Village of Ancients - I like the start with the bass and piano that go into the strings. The violin sounds really nice with the background melodies. This reminds of playing through a village in the sky, and has very beautiful use of chords. First: Floflo79 - Siteyra Town - I like how the rhythm guitar and main melody blend so well together to make a relaxing home village feel. The chords are really nicely put together too, and I can definitely hear this in a game like Chrono Cross or the like. Hello guys here's my voting. I apologize if I misinterpreted any of the pieces, but - you know - music is kind of subjective to a large extent shrugs. Even though many entries were rushed I enjoyed all of them, everyone should be proud of his work! [HM] Tigerchild: Man I love this piece, gives me the feel of walking through city ruins. Which, unfortunately, does not sound like hometown, to me at least. Still I feel like giving a honourable mention for it. [3rd] Basisti94: Very nice piece, love the choice of the chords. The only point I’d make, it gives a bit more of a melancholic feel rather than welcolming. [2nd] Birdnet: Sounds like a village going to sleep, it is very sweet. [1st] Floflo79: Definitely got the right feeling, the piece sounds like a light and welcoming place. Good job! floflo79 - Probably the most fitting entry for the theme. I was playing along on guitar. A pleasant, simple melody. The prominent shaker still takes me out of it a little though. Basisti94 - Lovely folk song with a tinge of sadness. Sad that they are leaving their home soon? Danilo_Ciaffi - Sounds introspective to me. Nice, but not quite relaxing enough for the theme. I'd like to hear it when you arrange the song for live instruments. birdnet - Really enjoy how subdued this is, like it could just melt into the backdrop and not get tiring after repeated listens. I think those high piano flourishes similar to 0:14 would sound nice sprinkled a couple more times later in the song. soundsandstuff - Pretty high energy and quirky. Not quite sure what kind of town this is, but it seems like fun! A continuation of Prince Buns? tiger_child - Great piano work. Playful, yet tense and anxious. Something tragic is about to go down. I imagined something more like a home under a waterfall or something here. Very peaceful. Honorable Mention : "Hometown" by Hslesperance. 3rd: "Village of Ancients" by Birdnet. Nice piano and strings. 2nd: "A Town on the Brink of Change" by Tiger Child. Beautiful composition, but i'm not a big fan of piano-only compositions. 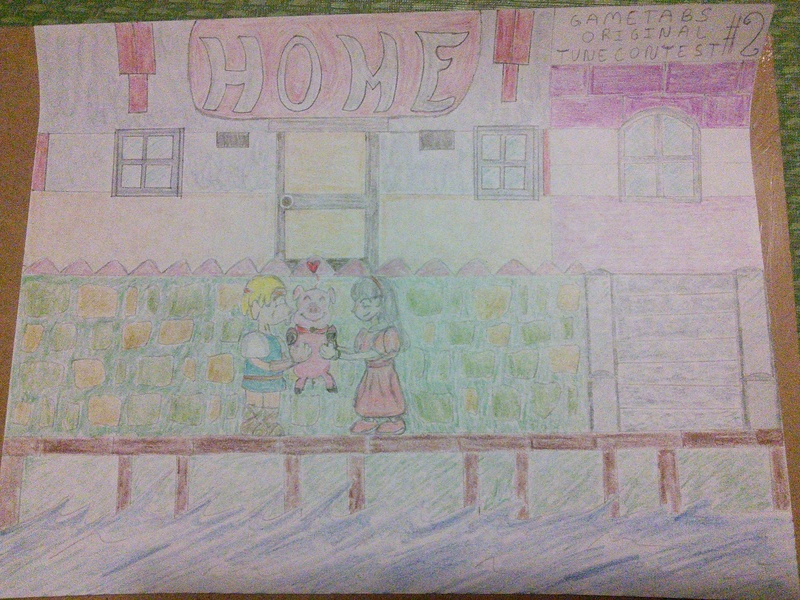 1st: "Hometown" by Basisti94. Cool strings, and I love the acoustic atmosphere. Congrats. Fridge Town by Soundsandstuff. I like how adventurous this one is with the concept; it really stands out from the rest of the submissions. I love the idea of it, but I do think that it is missing a bit of the softness that I personally associate with the theme. The song is good, but feels more like a situational theme than something for simply wandering the hometown. Home by Danilo Ciaffi. Gotta love chiptune JRPG hometowns. The drums were a touch I wasn't expecting, but they work really well. I like the composition, but I think that the sustain in the pulse wave sometimes clashes a bit with other sounds. If this was made with Famitracker, I'd suggest making the notes fade in volume as they sustain. Giving the sounds a pluck attack can go a long way towards making them work well with each other when you're constantly introducing new notes. Hometown by hslesperance. Really nice melody and countermelody work. The instruments are constantly playing off each other in a way that builds harmonic interest very well. The rhythm at the beginning sort of faked me out and made me lose track of the beat, but once the song settles in it grooves well. 3rd: Sitreya Town by Floflo79. Reminds me a great deal of a bunch of classic hometown themes; The calm arpeggiated guitar is a perfect choice for that. Really great song, bothing stretching the boundaries of what a hometown is, but fits perfectly. I love the pitch bends in the B section, they give a western-ish feel to the thing that really sets the mood well. I think the shaker could be quieter or mixed with other percussion, but besides that I have no complaints. 2nd: Hometown by Basisti94. I love how this one bridges between a traditional JRPG hometown and a country hamlet with the banjo and fiddle. There's a definite development in the song between the individual sections, which I love; you can feel that there's nuance to how the song wants you to feel about the hometown. Compositionally I think the tremolo picked part of the melody could have been improved in sound, but that's probably something that would need to be done with more than just exporting from Sibelius. That's something that would be an easy fix with a full recording of the song. Actually, it clearly says at the top of the page that the time for voting is on July, 1st. Hey man, unfortunately the voting is until July 1st, but the entries had to be submitted by June 27th (it is written in the original post as well)! Sorry i don't really have feedbacks to give (personal stuffs going on, hard for me to focus on music right now). I just think that the entries were lovely, people had really different approaches and it's nice. I made my choice based on the idea i have from a traditional home-town music in classic RPGs. I think this fits the theme really really well. This melody was actually stuck in my head, and unlike what some other people mentioned, I think it fits the theme really well. I can easily imagine it as a town theme. I wonder what kind of arrangement you were first working on but I really like the piano version as it I too. everyone is doing honorable mentions so i will also do that. HONORABLE MENTION - Siteyra Town, Floflo79. i really liked it but i couldnt get past the shaaaaker! sorry! THIRD - Fridge Town, Soundsandstuff. i just really appreciated something different. and honestly, i could see the people in fridge town coming outside and a lot of colors and neons and wild fluorescent lights inside the ice box where everyone is chilling out with this. SECOND - Hometown, Basisti94. Really lovely. It definitely felt like home. Since i grew up in a smaller town on the sea, tracks like this really feel nostalgic. FIRST - Hometown, Hslesperance. So really it was a tie between this and Basisti94's track. The tie-breaker, however, was that rhythm change and bass drop about 10 second in. Perfect. awesome, congratulations to the winners and all the participants! I had fun listening to all and thanks for the feedbacks!